Philippine Daily Inquirer publisher and former law dean Raul Pangalangan was elected as one of the judges of the International Criminal Court composed of 123 members on June of 2015. Pangalangan was meant to fill the seat vacated by late Senator Miriam Santiago. Santiago was the first Asian to be elected judge in December of 2011, yet resigned because of Lung Cancer in June 2014. Santiago passed away from the disease. “This is an honor not just for myself but for our country as well, one that builds upon a commitment to human rights that the Filipino people advanced at Edsa I,” he said. “I’m glad that the member states of the ICC have affirmed their confidence in our country, and that our government has entrusted me to seek the mandate to serve as ICC judge,” he added. Pangalanan's win was closely contested with an Iranian representative Ibrahim Aljazy who waas also a law dean. The former dean of the University of the Philippines College of Law, then fifty-six, was the only Filipino to be awarded a diploma by the Hague Academy of International Law. The all-out campaign to have Pangalangan elected to the ICC was waged from the US to the European Union, with strong support from DFA officials and Philippine Ambassador to the Netherlands Jaime Victor C. Ledda, Ambassador to Belgium Victoria S. Bataclan, Ambassador Lourdes O. Yparraguirre, the country’s Permanent Representative to the UN, and Ambassador Irene Susan Natividad, deputy permanent representative. 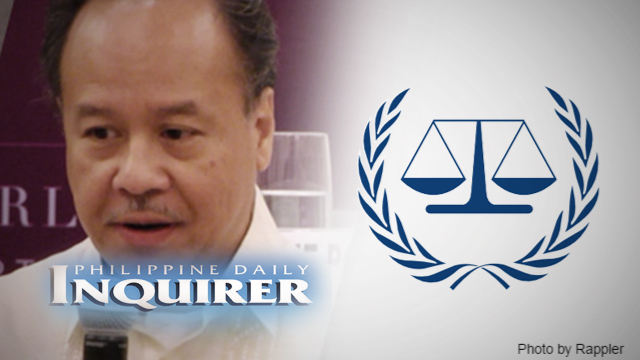 Inquirer has expressed its "great pride" with the election of their columnist-turned-publisher. “Dean Pangalangan joined the Inquirer almost three years ago to ensure that the paper adhered to the highest journalistic standards, canons of good taste and editorial policies,” said Alexandra Prieto-Romualdez said, adding that while she wished him the best in his new role, Pangalangan “will forever be a member of the Inquirer family!" Meanwhile, on Wednesday, President Rodrigo Duterte announced a move towards quitting the International Criminal Court, which has launched a preliminary examination of his drug war.